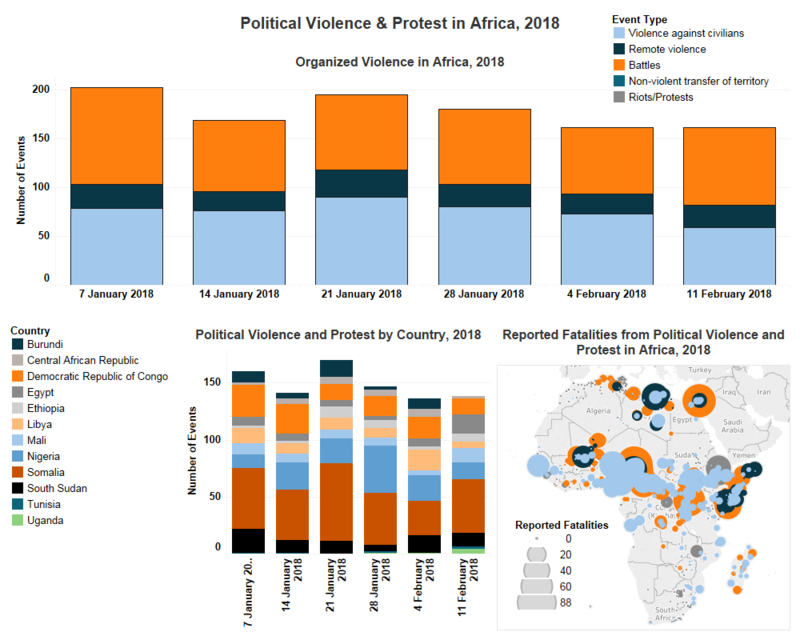 The number of distinct acts of political violence and protest across Africa remained stable last week. Yet some significant developments include: an increase in the number and intensity of clashes recorded in Egypt, Mali and Somalia and the resignation of President Zuma of South Africa and Prime Minister Desalegn of Ethiopia. Attacks decreased in Cameroon this week but the Sud-Ouest region remains vulnerable to scattered attacks by separatist groups. In the Democratic Republic of Congo (DRC), interethnic tensions between the Hema and Lendu groups remain particularly concerning, as the death toll has risen to more than 60 in a week. Equally, diplomatic tensions emerged between the Congolese and Rwandan governments, as Rwandan forces are accused of having penetrated DRC territory, and killing 10 FARDC soldiers during a clash in Virunga National Park. Last week, Operation Barkhane put significant pressure on the Ansar Dine network (or JNIM) in the Kidal Region of Mali, with multiple operations in Tin Zaouaten, Boughessa and Egharghar. These operations inflicted significant casualties including eliminating senior operatives. Low-level Islamist activity in central Mali, such as targeted assassinations and abductions, are being supplanted by multiple concentrated flashpoints of violence. In central Gao, armed clashes involved Imghad/Daoussahak Tuareg vs Peuls/Arabs. Similarly, in Mondoro, pastoral Fulani groups targeted Dogon communities. The intensity of these hyper-localized conflicts warrant careful attention. Even with low-level Islamist activity, the overall security situation in Mali could deteriorate further through these other conflict dyads. The Egyptian Armed Forces continued Operation Sinai 2018 to take on the Islamic State in the Sinai Peninsula, but also to secure the border to Libya in the Western Desert. Operations during last week reportedly led to more than 1000 arrested militants, 73 dead militants and 16 dead soldiers. Moreover, several hundred hideouts were destroyed and hundreds of IEDs defused or detonated. By contrast, violence in Libya fell to its lowest level since October 2017 as the United Nations pushes for elections by the end of 2018. Riots and protests remain unchanged from the previous week. This is so despite a very large increase in anti-government protests at the beginning of the week in Ethiopia. These culminated in Prime Minister Hailemariam Desalegn resigning on Thursday and a state of emergency being declared. Similarly, Jacob Zuma stepped down as president of South Africa. However, only one recorded protest took place in support of his resignation. The country remained calm during the political transformation. Guinea observed riots over local election results.